Very, very long-time readers may remember that I launched Tales of the Marvelous on November 1st, 2010–so today marks my 4th Blogging Anniversary! After more than 1,000 likes and 4,000 comments, I am so happy you all are here, in my book-filled corner of the internet. 😀 I don’t think I’d still be here if I was just talking to myself! I am perpetually trying to be better at replying to comments, but I read and value every single one. Readers of more than two years may remember that in 2011 and 2012, I participated in National Novel Writing Month (NaNoWriMo), when a lot of crazy writers set out to write 50,000 words of a novel during the month of November, and talk about it online. Last year I was publishing a novel in the middle of November, but this year my latest novel (which began as my 2011 NaNo project) has been out in the world for three weeks and I am ready for NaNoWriMo! I’m planning a new YA Fantasy novel, hopefully a future installment of my Beyond the Tales series. Right now I have only the vaguest of plots and no particular fairy tale I plan to draw from (though I do have my copy of the Brothers Grimm out and ready, and I’m eying “The Gallant Tailor” thoughtfully). What I do have are two main characters and a magic system. I’ve been knitting a lot this year, and when you knit a twenty-foot scarf with stripes of all different sizes, you start to feel there must be a pattern. Which got me thinking about knitting magical garments–what if the numbers of rows in each stripe really did matter? Seven rows for luck, twelve for good health, and so on. Readers of The Storyteller and Her Sisters may remember a lucky scarf near the end of the story–because I had a connecting idea just in time to add that into the very final edit! I’ll have new lead characters, but I hope to use a familiar country, and have at least one familiar character put in an appearance. As to those lead characters, I got to thinking (while writing this review, I think) about character archetypes. Specifically, the Dark Brooding Hero with a Heart of Gold, and the Ordinary Heroine Who Discovers Her Strength (see this review for more discussion too). Except I’m not going to write those archetypes exactly–I plan to switch the genders, and explore writing a Dark Brooding Heroine and a (seemingly) Ordinary Hero. Happy Birthday! Good luck on NaNoWriMo! Congratulations on your 4th blogoversary. I’ve been a faithful reader since the beginning and it’s been fun to be on this journey with you. 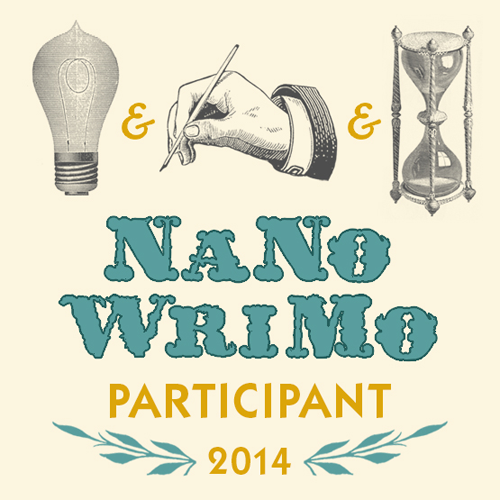 Good luck with NaNoWriMo. It will be interesting to hear how it’s going for you this time around. Happy blogoversary and good luck with Nano! !